Andrew and Katie embrace in a private moment in the Poinsett ballroom of the Westin Poinsett hotel at the end of their reception. The bride held her beautiful white bouquet, by florist Greg Foster, over the shoulder of her groom and the two hugged together in the last moments of their reception. 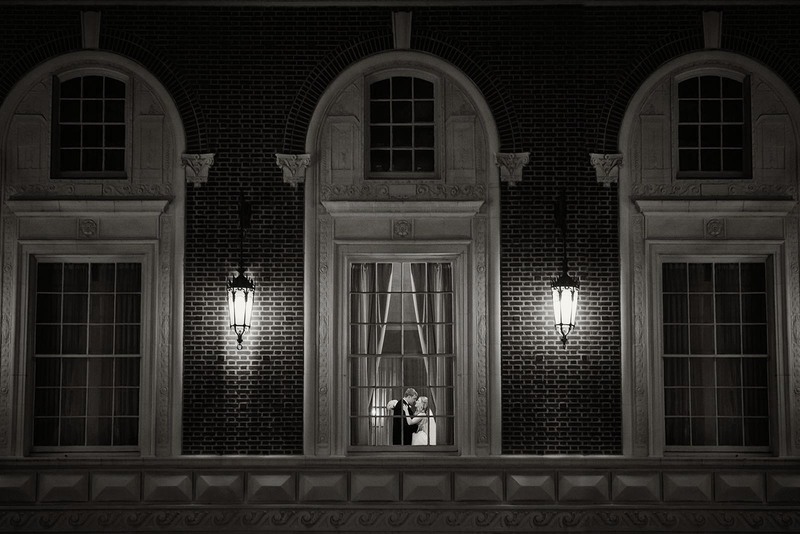 The photograph was taken from outside the hotel, peering in on the two in the beautiful arched windows illuminated by the lanterns on either side. I just love the sepia tone, the warm glow of the evening, and the private moment captured here. We always strive to make our photographs look how the moment felt, rather than just how it appeared to ordinary eyes. Katie and Andrew's Christmas wedding ceremony took place in the gold ballroom, and reception in the Poinsett ballroom of the hotel. The hotel was beautifully decorated with Christmas trees, a happy reminder of that special time of year.